Discuss and share stories and pictures, ask questions, seek and share knowledge about your animal companions and wildlife. My beloved Isis. She's been in my life for 13 years, and she's still so very healthy. of the sacred and magical world"
Yep, I tried it again and got the dreaded red message, "The file is too big. Maximum is 256 KiB. Jow do I shrink it? Twig, you have to make an attachment of it. See http://www.druidry.org/board/dhp/viewto ... 25&t=24482 for step-by-step directions. I love my tortie so much. She has been a constant part of my life for 13 years now, and I can't imagine life without her. Meet Lexi and Mara. Lexi is the torti and Mara is almost fully black, with a single hair thin white line across her neck. Lexi came to us on her own, being dropped out of a car at 5 weeks of age she was wandering in the fields around our home. One morning she came mewing at the door and nestled herself in our lives and hearts. I had to bottlefeed her the first few weeks, so our bond is really strong. My s.o. calls her my "doggiecat" since she follows me everywhere, comes when called, sits up to get her bowl of food. Because of her troubled start she was really scared of everything outside the familiar, so I decided to get her a helper-cat. Mara is born on a Demeter-farm in our town. The farmers only breed their cats when they know that they will find trusted homes for them or to replace their own mousers (the old ones move in to the home and retire on premises), they are well cared for and socialised with all kinds of animals, people that visit the farm-store, the kids had her already litterboxtrained and all. I told them that I would take the "left over" kitten no-one else wanted. It turned out to be the fully black one no-one else liked. Mara doesn't fear anything and is as bold as bold can be. Within a few weeks they were friends and now, Mara is now 10 months old, they sleep, eat and play together. Like good sisters, they also trow the occiasional hissy fit though. This is Brandy, Brandy is a adult rescue from a humane society. She was found wandering in the middle of a big city, scared of everything. In the beginning she would have seisurelike attacks when she got scared, but now, at (at least, since she was an adult when we took her in we don't know her age) 11 years and counting, she's a old lady that likes her daily walk in the garden. She's lumpy and bumpy, getting skinnier, but the vet says she's basically in good health, although she's the oldest rabbit he's ever seen in his practice. Her mate, Toulouse, was our first rabbit and lived till the ripe old age of 10 and a half. Now she bunks with our other widowed rabbit, Elsa. Elsa is living with us since 2009 and now about 7 years old. She came from our neighbour's hobby-farm as a mate for Whiskey, our third rabbit. Whiskey has always been a bit odd, we always suspected that he got dementia at around 7 years of age. He forgot who we were, who Elsa was, and forgot to eat. The vet couldn't find anything though and he passed at the (in our minds young but according to the vet respectable) age of 6 himself. Elsa is named after the lion because she's quite fierce for a little bunny. Whiskey and Toulouse died a few months apart and on a whim I put the little bunnie-widows together. They are really close ever since. This is the last part of our little menagerie. I told my s.o. one day I would like some chickens. Not five days later we heard crowing in our little yard. Three roosters and two chickens were walking around. A neighbour down the lane was getting elderly and couldn't take care of them anymore, so he asked our neighbour who has a large field with deer, goats, walibi, alpaca's and more in it, if he could put the chickens in their with the rest. Although my neighbour agreed, the chickens didn't. They moved in with us. I kept the blond rooster and the chickens and found good homes (not in stews) for the other two guys. The blond rooster is named "Geert" as a joke on a local rightwing politician known for its crazy blond hair and meaningless blabbering. Since our Geert also is blond and makes a lot of unnecessary noise we thought it would be fitting. Our Geert is really sweet though. The girls where Rose and Hyacinth (after "Keeping up appearances"). Later we got a white half-silky from other neighbours to ad to our flock, she's called Daisy. Since Daisy and Geert aren't related, they had two chicks last year, called Puck and Muck. Sadly, I had to kill Rose last year because she had gotten in trouble laying an egg and her whole girlparts were hanging out of her. Shadowcat, your animals are beautiful. I am, of course, drawn to the tortie, but they're all just lovely, and I'm envious of your menagerie. I'd have more animals if my situation allowed for it. I present you all Ludo, a Pyrennean Mastiff, 2 1/2 months old and huge already. 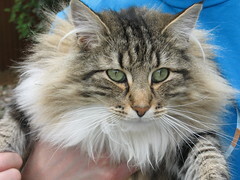 Named after the big, hairy monster in the Labyrinth and also short for peludo or "hairy" in Spanish. short for peludo or "hairy" in Spanish. Luckily he’s very gentle apart from a habit of sitting on my chair arm and trying to groom my beard. I can just about put up with the occasional lick - but then he starts trying to pull out any sticking out bits with his teeth in exactly the same way he grooms his own coat to remove loose fur. I can’t work out whether it’s a mark of affection or whether he just thinks I’m scruffy. "Had I lived I might have been clever" - from the traditional ballad "The Bonny Bunch of Roses"
Gwion, I would love to see that happening... I love those big hairy cats! By definition, humans are a great disappointment to cats. You're scruffy. I have the same problem. Lovely pets, everyone Especially the chickens! It's one of my goals to one day raise chickens. I'll start with a cat first, though, I think. Lovely pets, everyone Especially the chickens! It's one of my goals to one day raise chickens. Chickens are really great pets (and they keep your garden weedfree). They have great caracters and will become really tame. Although "outdoor"pets are different than say my cats, I love my chickies very much and spent a lot of time just being with them. Just watching them go about their day it very soothing to the soul. How long have you had yours? The rooster Geert and the brown hen Hyacinth are about 6 years old, I've had them for 3 1/2 years now. Daisy (the white half-silky) is about 3 and the youngun's Puck and Muck are 2. All of those I've had from the beginning. I keep them naturally (no artificial light in the winter) in a partically covered run with a coop in it and let them run loose part of most days. I still get about 3 eggs every day from februari till november. Since Geert and his halfsister Hyacinth are getting old and their sister Rose already died two years ago, I'm currently on the waiting list for taking in a few "new" heritage bred "Mergellandhoenders" (lit. Limestonefowl) a gorgeous all black breed. This is my beautiful dog Penny. She was born deaf and was at risk of being put to sleep due to her deafness. Luckily she was taken in by Dogs Trust and I adopted her. Because of Penny I now volunteer for The Deaf Dog Network, raising awareness of how great deaf dogs are, busting the myths that deaf dogs can't be trained or are a liability, and helping to find new homes for deaf dogs in rescue. Penny is extremely clever and is just the most loving dog I have ever had. She was 10 weeks old when I got her and she is now 16 months. She knows about 15 hand signals, including high five & play dead. Penny looks extremely bright indeed, Wyrdspirit. Sweet dog. And a cow! I love cows... Chikade, how wonderful!